We all know every series, whether in comics or television, there are bad issues or episodes. This issue feels like it’s coming back from one of those. 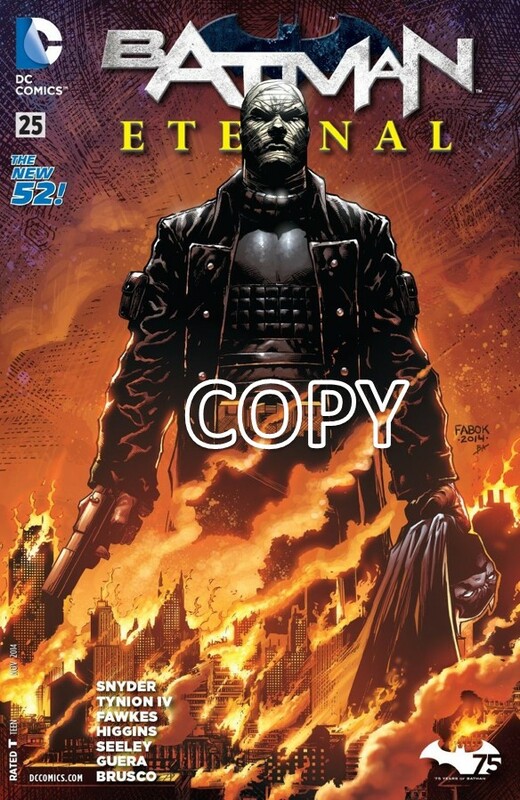 As always we begin with the cover, Hush stands atop of a burning Gotham with a gun in one hand and Batman’s cowl in his other hand. This makes me wonder if this is the issue where they go back to the first page of issue 1. This is a great drawing but Hush’s head covers up part of the title. We start the chapter at the Gotham Gazette with James Bard and Vicki Vail arguing over James Bard’s tactics. We are also introduced to a new art style. This art style is not very different from the last one although close-ups of characters look different. This opening makes the reader think that the bad guys are losing but I feel that this is just to put the reader in a false comfort zone. We cut 24 hours later to see that Gotham has gone to hell. Bombs have been exploding everywhere and we see a little girl being mugged by two men. This is something we already saw in the “zero year” story line as well as the “Arkham War” story line. This wouldn’t be such a bad thing if the story lines hadn’t just happened a few months ago. Harper Rowe jumps into rescue the girl as Red Robin critiques her hero skills. There is one big question ‘when did they get back from Tokyo?’ I’m glad to see Red Robin take Harper Rowe on as an apprentice. This opens up many possible story ideas for Red Robin. Red Robin gives Harper Rowe a combat test once the little girl leaves. Harper Rowe utterly fails the test. It makes sense that Red Robin would win in a fight against Harper Rowe since she is a trainee. I hope they keep this relationship for a while to show how long it would actually take for Harper to learn to be a hero. At the bat cave Julia is trying to understand why Bruce Wayne became Batman by to talking to him on the phone as Batman is doing a mission. While this is bad timing, it’s a bit funny as well. Whoever decided to make Julia the comic relief had a very good idea. Batman tells Julia that he needs information on the situation on Hush. Julia shows Batman a security camera footage from Blackgate Prison. Batman learns that James Bard is there and is up to no good. This is good place in the store for Batman to realize what is going on and hopefully we will see Batman acting smarter than he has in the last few issues. Red Robin goes to the hospital where meets up with the Red Hood who is looking after Alfred. I’m going to be honest here. I have no idea what the Red Hood and Alfred’s relationship was before the Red Hood died. Both Red Robin and the Red Hood are sad to see Alfred in this state. Red Robin and the Red Hood try to have a conversation to determine what’s going on but end up in an argument. There is obviously still some hatred between these two characters that is still unresolved. Red Hood asks Red Robin to get a hold of Batgirl so they can all talk to Batman. Batman breaks into a building looking for James Bard but instead he finds a hologram of Hush. He attacks the hologram without realizing that it is not Hush, showing his anger towards Hush. Having one guy that Batman fears makes him realistic and relatable to the audience. The way Batman and Hush are drawn in this scene is fantastic. We cut to Barbara Gordon’s apartment as she is on the phone with her father, Jim Gordon, from prison. Another realistic scene, seeing a concerned daughter trying to comfort her Dad in jail which gets interrupted by the Red Hood trying to call her. Barbara Gordon hangs up the phone and answers her cell phone to find out Red Robin is using the Red Hood’s cell phone. Red Robin tells her that all of them need to talk to Batman. I don’t know why, maybe I’ve missed something but I’m pretty sure I didn’t. We return to Batman arguing with the hologram of Hush as Hush tells Batman that he already won. This scene shows the worst thing that could happen if two friends become enemies. Hush’s speech is a bit boring. There is nothing clever about it. Hush says good-bye as he blows up the building where Batman is. Out of the countless times Batman’s been through an explosion he has never been hurt so I think Batman is fine. In the bat cave Julia is freaking out. She gets a call from Red Robin telling her that the family is coming to the cave. Julia is confused which is appropriate she has only met Batman and not the rest of the family. The scene changes to City Hall where James Bard is yelling at the Mayor to declare martial law. I will say this again, I don’t think the Mayor has the power to declare martial law. The conversation between James Bard and the Mayor could use better scripting. We end this chapter with Batman being rescued by Red Robin, Red Hood and Batgirl. This is a nice ending. It shows that Batman has a lot of work to do and yet he has small victories. This issue is good at showing the Bat Family as a group. Welcome back to yet another review, this issue fell short when delivering a story about a fan favourite character. As always we begin with the cover, the Spoiler jumps out of the page as the fire burns behind her. There’s a motorcycle jumping behind her while cutting off portions of her body. I understand what they are trying to do but this looks like they failed in every way although the artwork looks nice enough. 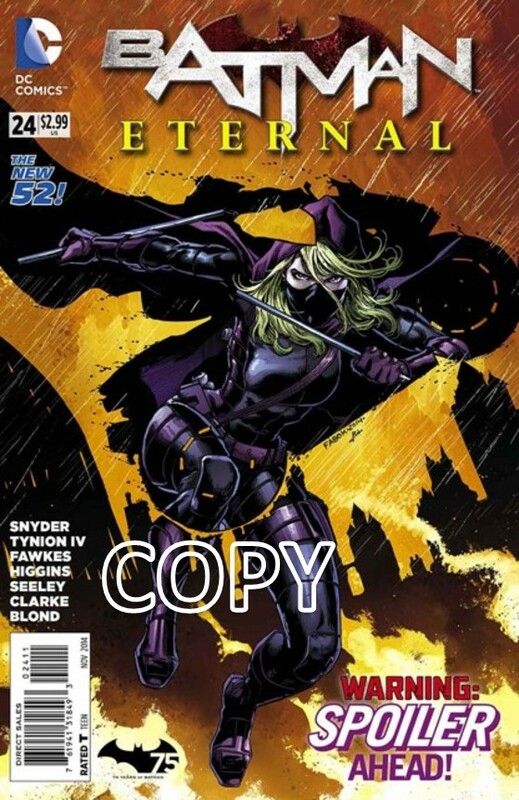 We open with Stephanie Brown as the Spoiler spying on her father, the Cluemaster. Her father is talking on the phone to someone who is annoyed that Stephanie is not dead yet. This is kind of a scene we see often but it feels a bit different because one of the people talking is her father. Hush comes out of the shadows and grabs the Cluemaster, angry that he’s not killing his daughter. I’m unsure if Hush is the same person on the phone and watching him from the shadows. It’s not really clear. We get a flashback of Stephanie Brown attempting a bike trick as her father yells at her to stop. This is an odd place for a flashback like this. We’re not sure who is even having the flashback. Stephanie makes the jump but falls shortly after and badly injured herself. Her father scolds her for being an idiot and shows that he can be a good parent. I’m glad we get to see another side of Cluemaster, a caring one. Returning to the present, Hush threatens Cluemaster as Stephanie Brown learns that her listening device is being hacked. I’m not sure if Hush knows who exactly is spying on them but I know that he knows someone is doing it. So far this book needs a lot more clarity. Cluemaster tells Hush about his underdogs doing the work. We get to see what each of them are doing, such as the Ratcatcher and the Prankster. The Ratcatcher … really? I mean, can you come up with a lamer name for a Super Villain? He looks like a farmer with a gas mask on. At least the Prankster looks decent. Hush finished up with Cluemaster giving him standard orders of ‘don’t get caught’ as he leaves. -It‘s obvious that Cluemaster is afraid of Hush as he has every right to be. We cut to an Art Gallery where Batman is trying to deal with a zombie made out of energy. We learn that Batman can’t even touch the creature otherwise he will die. This creature looks amazing and is probably a minion of Blackfire. Batman gets hit in the hand by the creature as he hits it with nth metal (from the Hawkman series). It’s going to be interesting to see what, if anything, will happen to Batman’s hand. Batman finds out one of the victims worked in Arkham Asylum as he tries to get a hold of Batwing. This is a really interesting way to go back to the James Corrigan and Batwing story. Last we see of Batman, is him just standing over the body as we hear the Cluemaster start to talk. There is nothing important on this page and feels like filler. Returning to Spoiler, we hear her talk about how her Dad has gone too far. She starts to fix up a motorbike for her getaway. I don’t think that would be the smartest idea while you are trying to hide from people. The Cluemaster walks up behind Stephanie and throws a gas bomb at her. This of course starts a fight scene where Cluemaster is trying to justify his actions. Like every fight scene in the universe. Stephanie gets away on that bike as an explosion happens behind her. How the heck did that explosion happen? There was no indication of anything like that. Cluemaster gets up and chases Stephanie on another bike. We also get a brief scene from the Terminator as Stephanie realizes her father is chasing her. Overall this is a good motorcycle chase. It feels like it is very fast paced. Stephanie Brown tries to call someone as her father gets rights beside her and starts to attack her. Stephanie eventually gets rid of her father by putting one of his grenades in his wheels. This is an uneventful end to the chase, I feel. We turn the page to find Stephanie jumping off her bike as it starts to explode. OK I give up. I’m not going to try to understand where the source of these explosions are coming from. Stephanie gets away from the explosions and jumps to a high platform where Cluemaster yells at her. The police arrive to arrest Cluemaster. I think that’s who Stephanie was trying to call. This was a clever plan on Stephanie’s part. We end the chapter with Cluemaster being hauled away by the police as Stephanie just smiles. This is kind of early to put Cluemaster’s capture in here. It gives Stephanie less of a reason to be a hero. This issue could have been a lot better, It felt like this was rush work. Welcome back to yet another review, this is great if you’re a Catwoman fan. As always we begin with the cover, Catwoman leaps away from gun fire while carrying a leopard cub. This is a weird cover that I would never have expected to see in this series. The artwork is nothing special and makes the cover a bit underwhelming. We open the chapter to a pit fight where the fighters are cats and dogs. It looks like Carmen Falcone is running the fight. We learn that the leopard cub from the cover is the next contender for the crowd’s amusement. This made me uncomfortable reading this. I am strongly against these types of events. As Catwoman assesses how she is going to save the cub as a rival gang breaks into the event and starts killing people. Of course Catwoman uses this time to save the cub. This rival gang is the Ibanescu family which I have no idea in hell who they are. We also learn that one of the members of the new gang, Tiger Shark, is an enemy of Catwoman. While the artist tries to make Tiger Shark look cool, his mask is stupid. How can he see with a bandana over his eyes? We cut to the Architect talking to Hush over the phone as Batman knocks the Architect out. I thought Batman already caught the Architect in the last issue. Maybe I read something wrong but I am pretty sure that Batman already dealt with this guy. We return to Catwoman as she helps the cub in her apartment bathroom. A random kid called Jade walks into her bathroom asking Catwoman to help a person at Blackgate. The problem is Jade says that he sent her but we don’t know who the “he” is. This is not the best way to incorporate mystery into a story. As the kid leaves, Catwoman asks how Jade will keep her identity secret. Jade leaves saying that she doesn’t care who Catwoman is. This isn’t really the best reinsurance in the world. We cut to the underground to see Killer Crock killing some monsters while talks about his people needing him. I felt like this came out of nowhere and really wonder why the writers decided to cut to this right after Catwoman. Catching up with Batman, we see he is continuing beating up the Architect. He’s also trying to make the Architect tell him about Hush. This is irrelevant to the story and acts like filler. We get a quick peek of what Julia is doing in the bat cave. She is playing around with the Bat computer. While I like this comedic approach to Julia as a second Alfred, it is a bit odd for her character. At Blackgate prison, Catwoman learns that it was Leo who summoned her. Catwoman yells at Leo implying that they have a history together. This is an interesting turn of events and makes me wonder if there is history of Gotham we are not yet being told. We learn that Catwoman’s father is non-other than Leo. This is completely a shock because we’ve been wondering about Catwoman’s family since Catwoman Issue 0. Catwoman punches her father in the jaw out of rage. I feel like this would be a realistic reaction if a child had been abandoned. Jade knocks Catwoman in the back of the knee just for fun as Leo tries to talk to Catwoman. Brat. Leo is trying to ask Catwoman to become the kingpin of crime in Gotham. Nice Dad. First thing he asks to do when you reunite with him, is to ask you to become a crime lord! Here I thought that my parents had high expectations. We return to Batman interrogating the Architect as Julia tells Batman there is something wrong with the building they are in. You would think Batman would have already done research on this but apparently not. 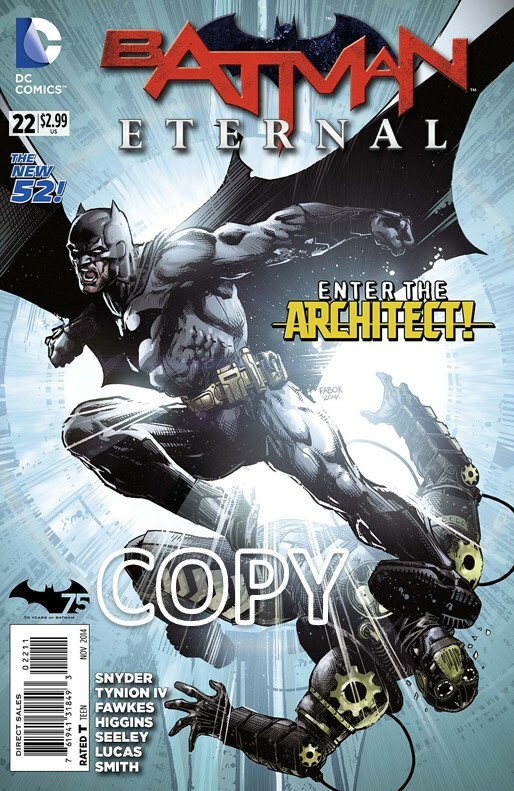 An I-beam falls in front of Batman knocking him down and making room for the Architect’s escape. This is way too convenient for the Architect and is a bit unrealistic. We than see that bombs have exploding all over Gotham City. Did this happen while Batman was fighting the Architect or did it just happen? We get a good drawing of a destroyed city. We learn that the bombs are happening as we speak. We see Catwoman and Jade entering the underground as the floor of sewers break apart. Jade falls down one of the cracks but Catwoman saves her. While I love new characters, if Jade is going to stay, she is going to need a ton more character development. We cut to the centre of town learning that Hush is behind the bombing. Hush is mad that the tower that the Architect was in didn’t collapse. Hush yells out like a madman asking the people while the tower didn’t collapse. I always thought Hush was the type of guy to be in the shadows, not out in public. In a clinic on the other side of town, Catwoman takes Jade to a friend of hers who is a doctor. I love this aspect of Catwoman. She always helps children no matter what even if she is being a ‘bad guy’. 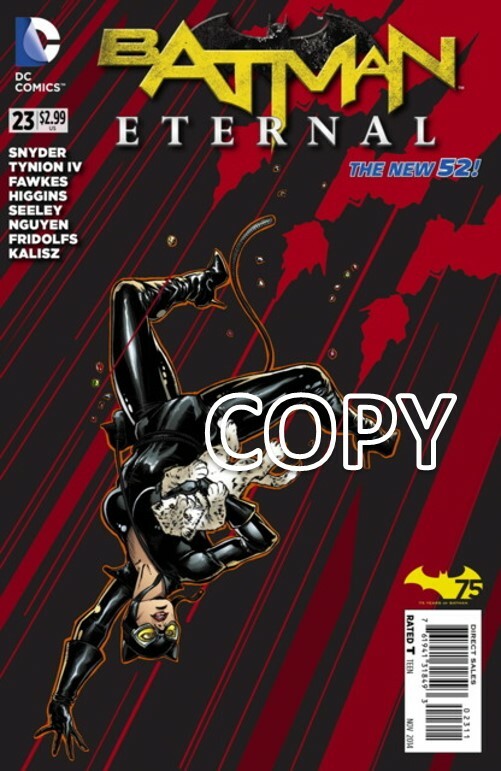 In a flashback, Catwoman returns to her father as he begs her to become the crime lord. I have no idea why she returned to him. Maybe she is considering his offer but it is unclear. In the mayor’s office, James Bard talks to the mayor about how he believes that all violence in the last few months are connected. I thought the mayor was in on Bard’s plan. I know he was buddies with Carmen Falcone. We end this chapter with seeing a bigger gang was starting and children being possessed by an unknown spirit, probably Blackfire. The last thing we are seeing is James Bard asking the mayor to declare martial law. This is very clever of James Bard but I’m not convinced that a mayor can declare martial law. This issue was lacking in quality when Batman was on the panel, other than that it’s a good issue. Welcome back to yet another review, this issue has great character interaction but uses twice as much time than needed. As always we begin with the cover, Batman karate kicks the Architect as light shines from the background. The tagline is “Enter the Architect”. Not sure if this is a Bruce Lee reference or not. This is a well-drawn cover but a bit boring. We open at Wayne Manor as Julia tries to get hold of Bruce Wayne via telephone. Julia is just trying to tell Bruce that her Dad, Alfred, is in the hospital. This scene is relatable to everyone as everyone has had a family member in a hospital at some point in their life. Emotion coming out of Julia is realistic. As Julia hangs up the phone, she starts to investigate the grandfather clock where she finds a secret passage. She already knew that this mansion has secret passages so the amount of surprise she is drawn in is a little too much. We cut to a tower under construction as two business men are talking about the new Wayne building. As they talk, gun fire erupts killing one of the business men. While this is pointless dialogue it gives a good introduction to the shooter. We find out that the shooter is the Architect and his gang. The Architect looks like he is a cross between Ironman and Skeletor. As we see the workers in fear, we hear Batman talking about searching for new leads. Not sure if it would be the right time to put this dialogue here. We cut to Batman riding around the city as he tries to get hold of Alfred. Why don’t look at your damn cell phone once in a while? I’m sure you carry a cell phone with you. Batman stops at one roof top to see through binoculars the Architect pulling a panel off a building. Batman, I think you’re going to be a little late the crime scene as one person is already dead. Back at Wayne Manor, Julia enters the bat cave to find all of Batman’s gadgets and the bat computer. Her reaction is very realistic seeing something as amazing as the bat cave. We return to Batman as he hops in the batmobile and tries to contact Alfred but he get Julia instead. Why did Batman hop in the batmobile? He was only a few roof tops away. Julia tells Batman that Alfred is in the hospital. This is a great way for Batman to have the news delivered storyline wise, not realistically. Julia tells Batman about the attack in the mansion last issue as she yells at him for bringing her father into a dangerous life. While Julia makes a good point, her Dad was a war hero so I’m sure he is used to danger. Batman said he can’t go to Alfred right now otherwise more people will die. This is very accurate to the Batman character. He is like Spock … “the needs of many outweigh the needs of the few”. We return to the Architect as he is modifying the tower. It is obvious that the Architect knows the business man in charge of the building construction. This is an extreme example of a disgruntled designer. He is going beyond ‘going postal’. We cut again to the hostages and the Architect’s henchmen as Batman crashed through the window. The expression on one of the henchman’s face is one see often but it’s funny every time we see it. The business man pleads for everyone’s life as the Architect just ignores him. This shows the Architect as a typical psychopath, not caring what other people are saying as he does his work. As Batman frees the hostages, the henchmen escape only to have the building start shaking. Batman asks for help over the com thinking it is Alfred but Julia answers “how the hell should I know”. This is a bit of humour in a terrifying situation which I like. It also is more of a set up for Julia to take her father’s place. Batman asks for help from Julia and kind of guides her in how to work the Bat computer. She picks up quickly which makes sense being a secret agent. While this scene is great, the art looks like it’s from a completely different artist. The Architect goes to kill the construction manager as a Batarang hits the back of the Architects head. While I know that the Architect isn’t dead, it looks like the Architect’s helmet exploded. Batman saves the construction manager, sending him down a zip line as Batman stays to deal with the Architect. This is a typical rescue scene but its formula that works and I don’t see any reason to change it. Batman grabs the Architect and asks him “Who do you work for?” The Architect just talks in weird riddles which Batman understands. This question scene gives us answers we already know. On the ground, the construction manager is confronted by a man in shadows who shoots and kills him. We can tell from the shadow it’s Hush. Batman watches in terror as he talks to himself begging that it is not Hush. This shows that Batman still has a bit of fear of Hush. We end with Hush standing over the dead body saying “shhhh”. This last panel makes Hush look as menacing as he should be. This issue had a lot of set up for the second act, maybe a little too much.